New technology which will be available for consumers in a while. In their homes or in other places. Maybe patents have been filed just now, maybe it has been demonstrated somewhere or maybe it is currently used in commercial applications. Last summer, a research group of MIT scientists debuted a new video amplification algorithm that exaggerates slight changes in movement or color, like a magnifying glass for moving images. Since then, they've made the open-source code available and started allowing anyone to upload videos and see the effect for themselves. The New York Times got inside the lab to see what they project is doing in this video. Read their full paper including the source-code here. Computers will be able to understand human behavior in a better way than we do. They’ll sence any small motion, any small change in our behaviour. They’ll use the lessons learned in physiognomics. They will be the best possible communication partners, and applied as brand agents, virtual characters representing brands with these motion magnifying capabilities, it will revolutionize the world of marketing communication. Most gesture-control systems require some kind of external sensors that "see" you, with optical sensors or depth sensors or cameras. They're on the outside, measuring your movements the same way human eyes do. And that's fine, but a new wristband advertises itself as a system that's more internal--it's directly controlled by you. You make gestures similar to the ones you'd use on an Apple trackpad, except in the air: you'd wave a couple fingers to rewind or pause a video, scroll through pages, that kind of thing. It's compatible with Windows and Mac OS X to start, but since it connects via Bluetooth, it could conceivably connect to just about any mobile device as well: smartphones, tablets, or even drones. Now computer are getting additional input from humans: gestures in the air, instead of mouse and keyboard. The next step will be the recognition of human gestures, i.e. gestures we already use in our day 2 day lives, having conversations with chatbots like we would do with normal human beings. That will really feel natural. Researchers have created a lithium-ion battery that keeps on working when stretched to four times its initial length--and bounces back into shape once you let go. In the future, stretchy batteries such as these could help power solar-energy generating clothes, tattoos that monitor your vital signs, robot skin that's sensitive to touch and other futuristic, flexible devices. And what about making roofs of these batteries? Any objects created by man could carry batteries, displays and cameras. Your whole house can be a display to! Camoflaging itself in the rainforest, charging itself by sun. Or an aircraft, constantly charging itself at heights. Or robotic humanoid skin to charge all its transistors and sensors. 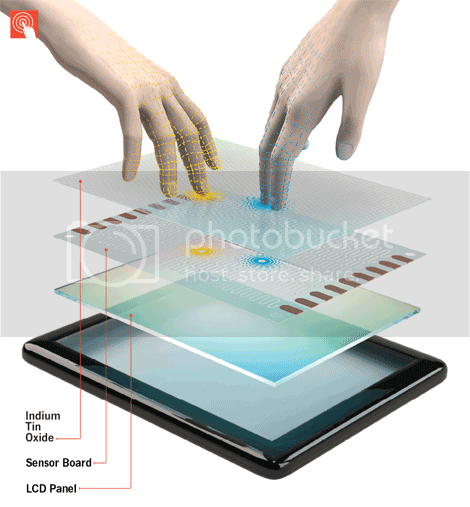 Touchscreens treat all fleshy finger pads alike: Most detect a simple change in electrical current or in sound or light waves regardless of who is swiping. Researchers at Disney Research, Pittsburgh, have built a touchscreen that can discriminate between users. Every person’s body has its own bone density, muscle mass, blood volume, and water content. The device, called Touché, sends a series of harmless currents through a user’s body. Physiological differences produce differences in the body’s impedance of that current. Touché measures this unique capacitive signature. Scientists could apply capacitive fingerprinting to any touchscreen, or to other ubiquitous objects, such as doorknobs and furniture, turning the world into an interactive device. Touché is still in development, and plans for commercialization, alas, are top secret. All brands will be able to recognize consumers and continue the dialog where they’ve left off the time. This begins with authentication technology and this is perfect step in this direction! Now, we’ll to touch a screen, soon, we’ll be recognized through our unique field around our bodies. We've all seen 3D sensors before. In the Microsoft Kinect, for instance. That sensor's design was licensed to Microsoft by +PrimeSense. At CES this year, Robert Scoble visited Primesense to get a look at its latest 3D sensor. What is big about it? First of all, it's small. Small enough to fit into tablet PCs. Second of all, it's lower cost. Will sell for under $100. Third of all it's more accurate and higher resolution than the one in Kinect (it is so accurate it can tell how hard you are pressing on a surface). Why is this world changing? Because nothing can track human behavior quite as well as a 3D sensor. Expect to see these start to appear everywhere. In cars. In games. In tablets and TVs. And more. ALL screens will be 3D. In transparent mode, we’ll be able to look through them, and notice, very naturally, that the perspective changes when we move our head, and when we rotate the screen just a little the perspective will change as well. In non-transparant mode, we’ll have a view on a virtual 3D world and we’ll notice, very naturally, that the perspective changes when we move our head, and when we rotate the screen just a little the perspective will change as well. and obviously we have mixed mode. That’s the essence of the media-completion trend: the virtual world will be as naturally as the real world. This LED grid created by students of the Delft University of Technology contains 66x28x28=76032 pixels. It contains animations of rotating flowers and more artitic experssions. In the future, these grids will be unlimited detailed. Now 76,032 pixels seems a lot, but at that time we’ll easily have 76,032,000,000 pixels. The pixels will be so small that our human eye won’t be able to distinguish them from each other. Applications will be countless. We’ll have conversations with other humans on a distance, or even interact with virtual humans. Prototyping, education, and brand interaction. Everything will change with technologies like these. An awesome 3D See-Through Display!